Mission: When a child dies, at any age, the family suffers intense pain and may feel hopeless and isolated. The Compassionate Friends provides highly personal comfort, hope, and support to every family experiencing the death of a son or a daughter, a brother or a sister, or a grandchild, and helps others better assist the grieving family. Vision: Everyone who needs us will find us and everyone who finds us will be helped. Our Lehigh Valley Chapter is one of over 660 chapters of The Compassionate Friends across the United States. 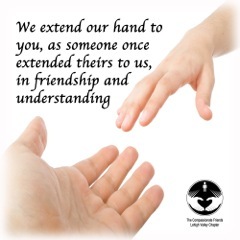 We are a nonprofit self-help organization, offering friendship, understanding and hope to families grieving the death of a child of any age and from any cause. Our monthly support group meetings are the heart of the chapters healing experience. Meetings provide a caring environment where you can feel free to talk, cry and express your feelings without fear that someone will turn away or try to change the subject. If you’re not ready to talk yet, you are welcome to come and listen. Everyone who attends and facilitates meetings are bereaved parents, grandparents and/or adult siblings. Some are new in their grief, while others have been coming for several years. We hope we can show you that you can survive and that your life can become meaningful again. Surviving does not mean forgetting your child. It means remembering your child’s life and what it meant to you, rather than their death. It means being able to smile again and not feeling guilty. And it means possibly being able to help others along their grief journey sometime in the future. In addition to monthly support group meetings we also provide grief support through chapter newsletters; telephone & email support, lending library of grief materials and special events honoring the memory of our children. Support Group Meetings are held on the second Monday each month from 7 to 9 pm at Sacred Heart Hospital (2nd Floor Conference Area), 421 Chew St. Allentown, PA. Newcomers please arrive a half an hour early for a brief orientation. For detailed directions and more meetings information click on the meeting tab.